It can be difficult to anticipate what expenses you should budget for if you’ve never lived on your own before, or if you had less expenses to worry about in college. For example, even though I was tracking my expenses and income when I graduated, moving in with my then-boyfriend and figuring out a budget entailed a lot more than I thought it would. I don’t think I’m alone in my experience. It’s easy to make financial mistakes in your 20s, but learning to manage your money wisely can make a difference. If you’re new to managing your money, here’s a sample budget for college graduates that will help get your finances on the right track, help you achieve your goals, and enjoy life along the way. Many people find it difficult to start a budget, especially if they’re new to managing money. Thankfully, it doesn’t have to be that way. Here are ten things that should be in your first budget after graduating from college. When I first moved out, I looked for places with utilities included in the rent. That made my life a lot simpler when it came to budgeting as I didn’t have to worry about what heating or cooling was going to cost me each month. As you consider the expense of rent in the overall picture of your expenses you want to track your spending. Tracking your spending lets you stay on top of all your expenses by showing you where your money goes each month. Tracking your spending sounds difficult, but it’s actually quite simple – especially when you automate it. Tiller is a Google Sheets-based service that automatically pulls all your banking and other financial transactions so you can categorize your spending and find opportunities to save. Tiller is free to use for the first month, then $5 per month thereafter. Everyone’s appetite is different, but my fiance and I hover around $300 per month for groceries. If I were budgeting just for myself, I’d probably spend $75-$100 per month, only because my appetite is very small. Ibotta doesn’t just work at grocery stores, it also works with over 350 vendors (both physical and online stores). Ibotta connects to your PayPal or Venmo account so you can get paid right away. If you’d rather not scan receipts, you can use the Ibotta app on your phone to locate sales for the store you’re at. If you’re able to land a job before you move out, I recommend moving as close to work as possible to cut down on transportation costs. Rent may be higher depending on where you work, but if you can get by without a car (and minimal transportation), the savings could make up for the increase in rent. Besides that, sitting in traffic isn’t fun. It’s a good idea to leave this category for last when figuring out how much money you can allocate to it in your budget, as most of these expenses aren’t needs, but wants. This might be a “boring” category, but it’s a must to include if you have a renter’s insurance or car insurance payment due every month. PolicyGenius is a great option for most insurance needs. They offer renters insurance, health insurance, life insurance, auto insurance and more. PolicyGenius doesn’t offer coverage themselves, but they let you compare the best providers so you can save money and get the policy(ies) you need without spending too much. I prefer to keep this separate from utilities since your phone isn’t exactly a “living expense” – you don’t just encounter it when you’re at home. It’s also probably one of the first bills you were responsible for paying yourself. As such, it can be easy to fall into the trap of thinking you have to spend $100+ per month for your service, but you don’t. One MVNO example is Republic Wireless. Republic Wireless offers unlimited talk and text plans starting at $15 per month, with an additional $5 per GB per month if you want data. There are other similar carriers out there that, like Republic Wireless, let you save $50+ per month in this budget category. It’s typically best to automate payments as most lenders offer a .25% reduction in your interest rate, helping save you money on interest. You never want to be late on a payment, so it’s important to have the funds ready to cover your monthly debt payments so you can pay off your student loans fast to become debt free as soon as possible. Synchrony Bank is a good option if you’re new to saving. Synchrony pays 1.65 percent on your cash (more than 22x the national average) and has no minimum balance requirement. If you’re a proud owner of a furry family member, you should absolutely budget for any pet-related expenses, such as food, litter, toys, behavioral classes, or medicine. These are oddball expenses that tend to get forgotten, such as birthdays, car registration and inspection, speeding tickets, taxes, or annual memberships. 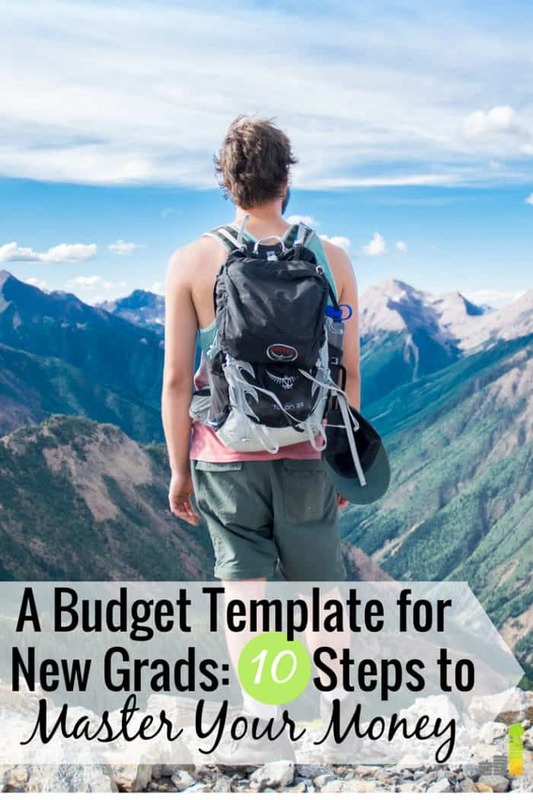 The post A Budget Template for New Grads: 10 Steps to Master Your Money appeared first on Frugal Rules.